It has been almost four years since the first gathering of students and Elders in the Elk Rapids High School media center. It is a great deal of work to make a book. You can read about the beginning in this 2008 post about the Elk Rapids Elders Project. You can read the next chapter right here. Here’s a holiday recipe from poet Terry Wooten. Gather 25 Elders from the Elk Rapids community. Add 41 middle school and high school students filled with questions. Stir gently. Stories will emerge. Simmer with dollops of laughter and tears. Listen for the poetry in everyday speech. With patience you can make a whole book. It will be delicious. Horses flounder in ice-covered Elk Lake, an armada steams into Tokyo Bay for the Emperor’s surrender, a sand dune towers where the industrial park is today, a cattle truck careens into a school bus. The vivid images in this book will stay with you a long time. 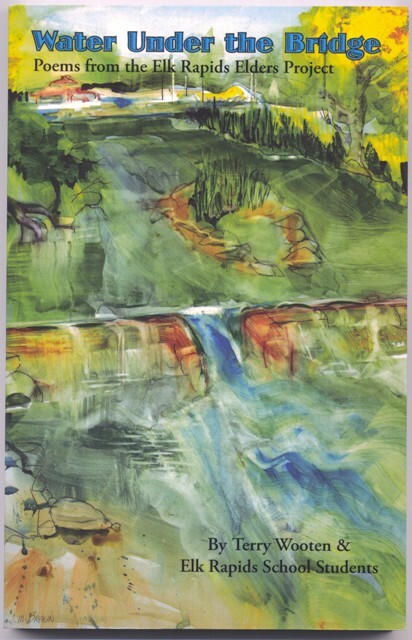 Water Under the Bridge: Poems from the Elk Rapids Elders Project, by Terry Wooten and Elk Rapids School Students is available now at the Nature Connection in Elk Rapids and at Horizon Books in Traverse City. Sales of the book benefit the Elk Rapids Area Historical Society, which sponsored the Elk Rapids Elders Project and published the final work. and kept getting it back. Nobody realized how much work was involved. who did a lot of illegal things. but never paid her taxes. They got everybody to stop biding. The local people came to our defense. to ever happen in my life. stormed up and shook her finger at me. which was bad for business. People had to have a place to go. Ellsworth is a close-knit community. But people here hold together. I’m proud to be a part of it!